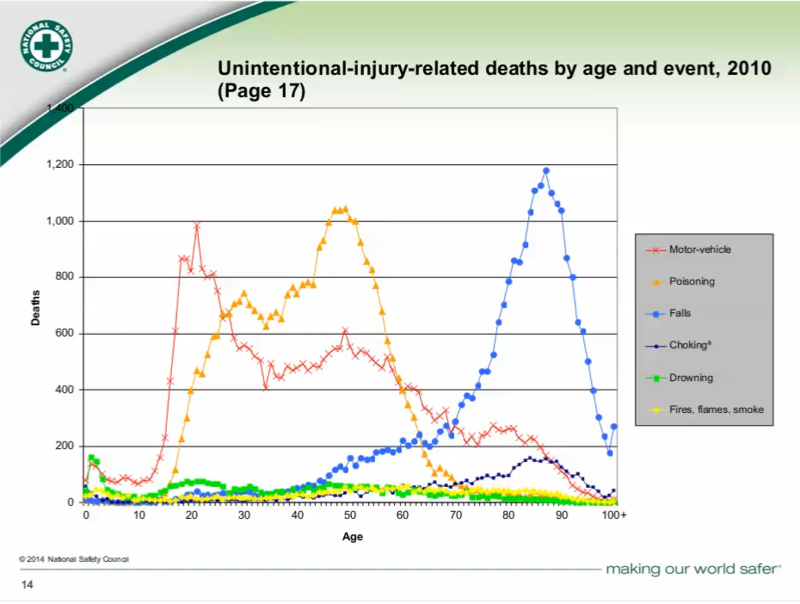 The “Injury Facts” report is an annual review of the latest injury and fatality statistics and trends. It has been published for 90 years by the National Safety Council. Most recent data include 2010, 2011 am 2012 data depending on subjects. 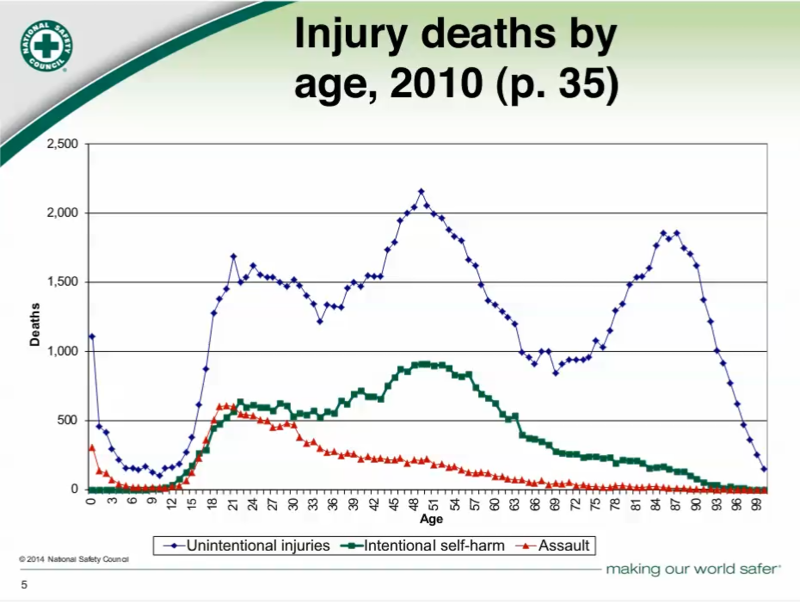 There were 180,811 injury related deaths in the US in 2010 and most of them (120,859) were accidental. Unintentional injury is the leading cause of death for people 1 to 42 years old and the fifth cause of death for all ages behind heart disease, cancer, chronic low respiratory disease and stroke. 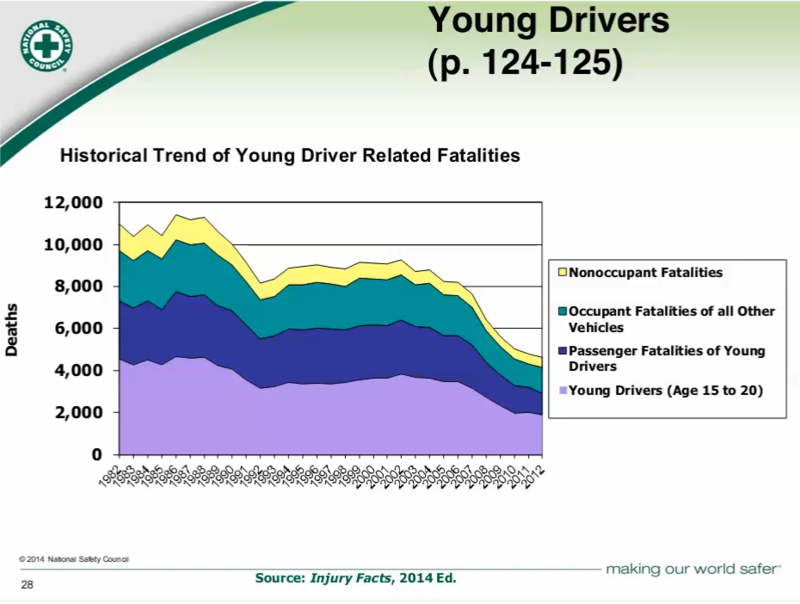 The 2010 data are the latest official data but according to projections from the National Safety Council , the number of unintentional injury related deaths in 2012 was 127,200 with 36,300 of them related to motor vehicle accidents. 63,000 of them happened at home, 26,000 in public places and 3,695 at work. The National Safety Council data shows an increase of deaths due to motor vehicle crashes, poisoning, falls, drowning and choking. 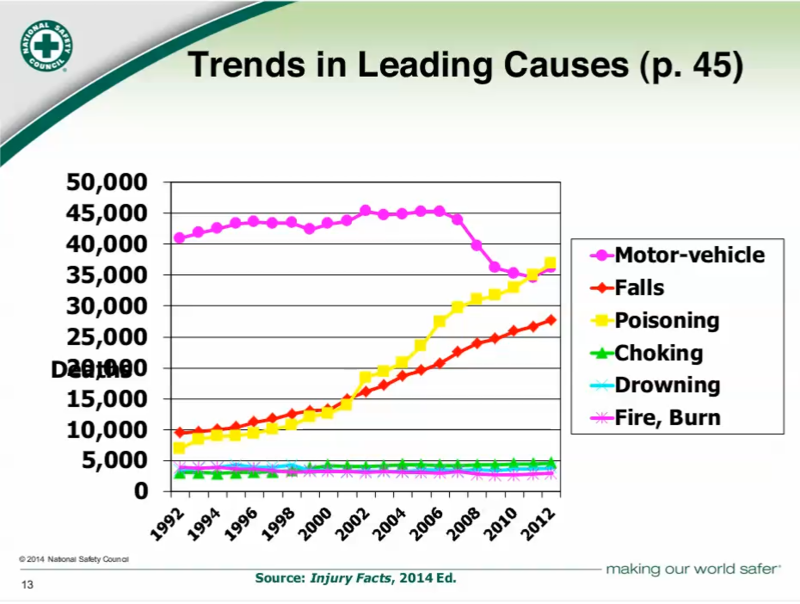 Motor vehicle accidents are one of the leading causes of injury related deaths, but recent trends show a significant increase in falls related to the aging population and a dramatic increase in poisoning related to unintentional prescription drug overdoses especially opioid prescription overdoses. The motor vehicle death trend was down for the last few years. According to the NSC it is related to recession. People drive less during a recession and therefore less motor vehicle accidents occur. 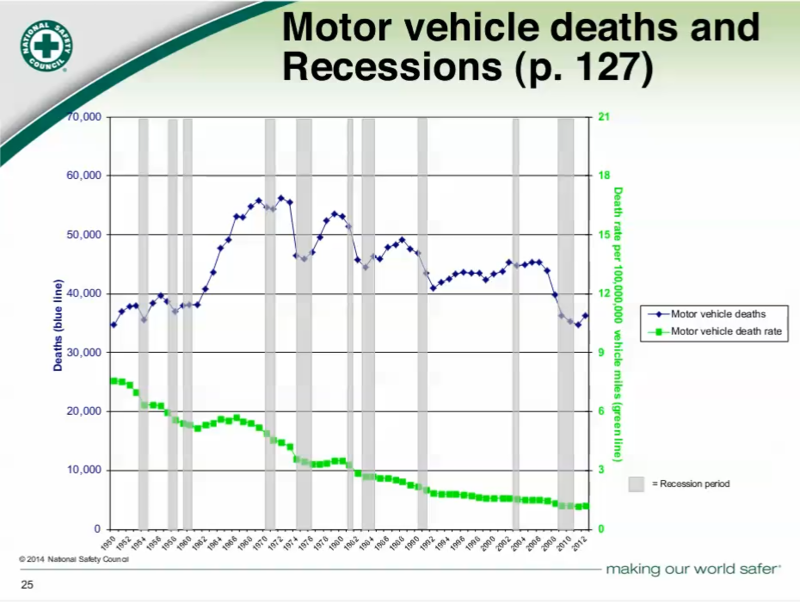 Below is a graph that shows a global decrease of the motor vehicle death rate since 1950 in green and in blue the real number of vehicle deaths since 1950 with the recession periods indicated in grey. A dip can be observed during each recession period. Motor vehicle crashes remain the No. 1 cause of death for teens. The number of young drivers dying in crashes and the number of people dying because of them is too high however it has decreased by half since 1982. The NSC estimates that 26% of all crashes are related to cell phone usage including, hand held, hand free and texting.. Alcohol is responsible for 31% of all motor vehicle deaths. Motorcycles represent 3% of registered vehicle and 0,6% of vehicle miles traveled but 15% of fatalities. 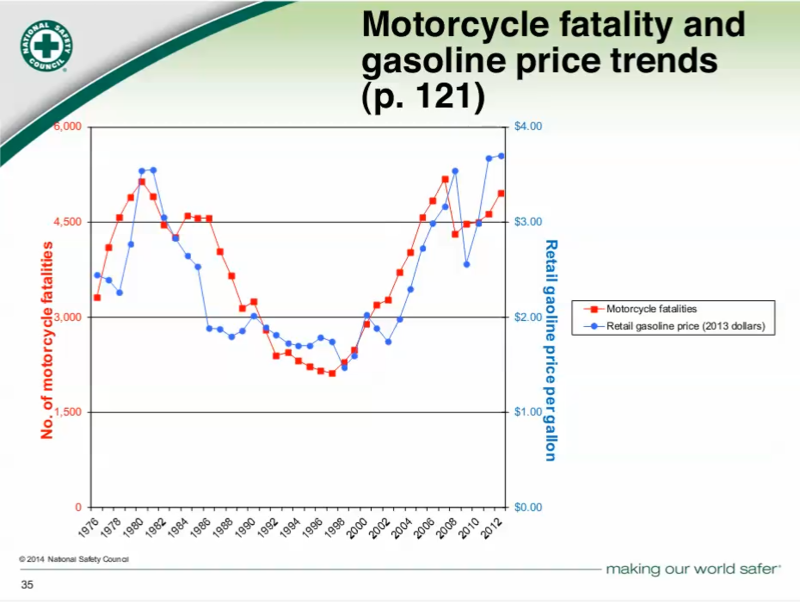 Motorcycle accident related deaths are highly correlated with the price of gas. When the price of gas increases more people choose to use their motorcycle. 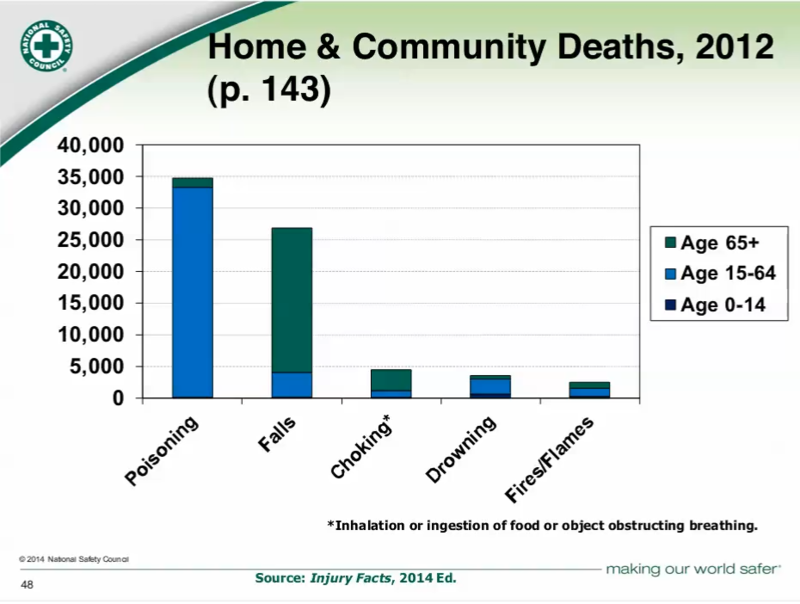 In regards to deaths related to accidents happening at home or in a community, poisoning is the leading cause of deaths among 15 to 64 year old people and falls are the leading cause of death for people above 65 years old. Unintentional poisoning is a relatively new and concerning problem . It was quasi existent in the beginning of the sixties and mostly related to children who were accessing products in the medicine cabinet or under the kitchen sink. In the following years, information campaigns contributed to a decrease in children poisoning and kept the children poisoning rate low. 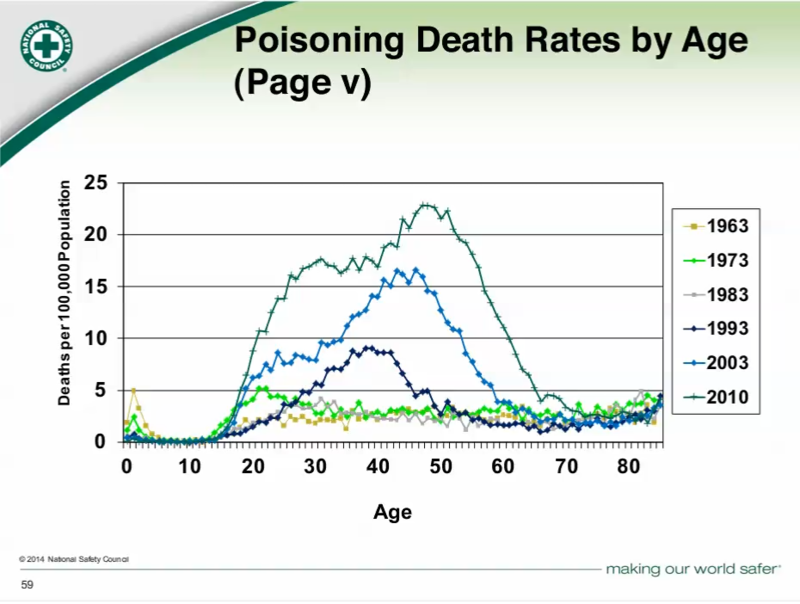 A poisoning trend never seen before appeared in the nineties: unintentional poisoning deaths among those 30 and 40 years old. The trend expended to young adults in their twenties and older adults in their fifties in 2000 and even more in the latest 2010 data. Half of these unintentional poisonings are associated with prescription drug deaths.